We had an amazing time at our first FRIENDSGIVING! If you’ve ever seen a Thanksgiving episode of Friends, then you already know everything about this holiday. 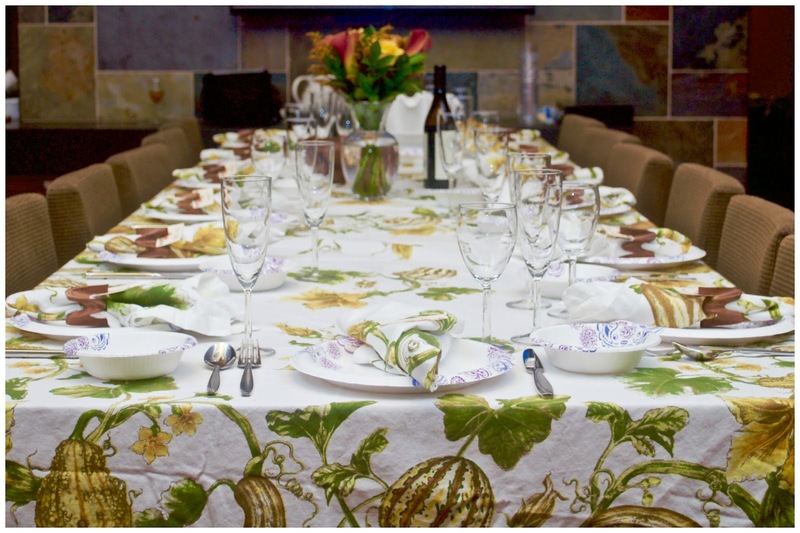 Friendsgiving has become increasingly popular for those geographically distanced from their families, can’t afford holiday travel or want to escape typical family drama. These gatherings may not be as conventional as a family dinner, but what they lack in tradition they make up for in originality, fun and YUMMY food. 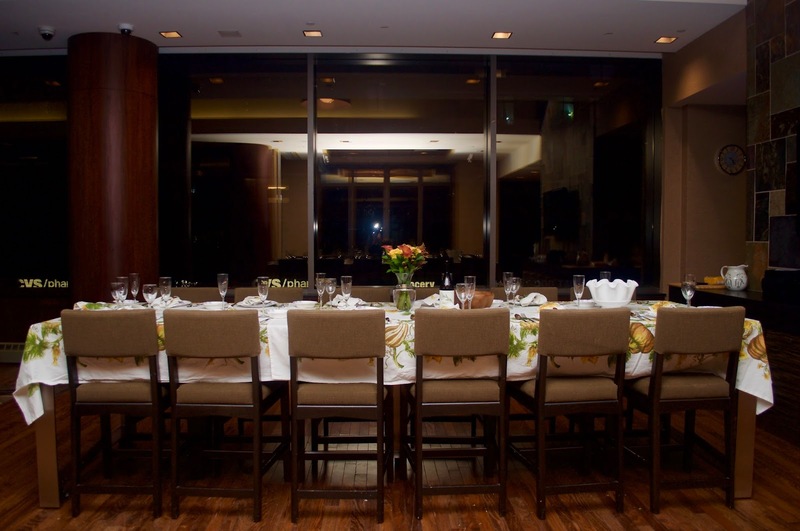 We wanted our first Friendsgiving to be an elegant, formal affair, so we limited our guest list to 13 adults that can comfortably sit around our dining table. If you want to host a larger party, you can always switch to a casual buffet style dinner. Cooking a Friendsgiving meal for 13 can be overwhelming so we asked each guest to bring a Thanksgiving side dish or appetizer. We started with a cheese plate, pear and goat cheese crostini and pumpkin soup. Typically the host will take care of the turkey since a cooked bird doesn’t travel easily. Our friend, Nikos, volunteered to cook a 20 lb turkey in our kitchen. A general guideline for turkey size is 1-1.5 pounds per person (go bigger if you want leftovers). If making a turkey from scratch is too daunting, consider buying a roasted turkey from a gourmet supermarket or adding non-whole bird dishes to your menu. 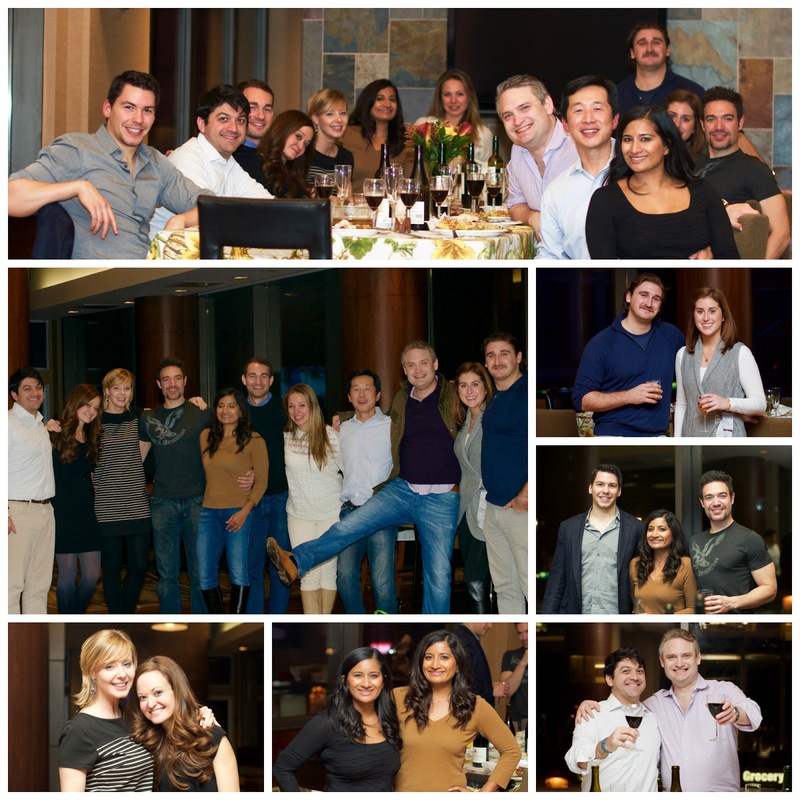 Remember anything goes at Friendsgiving! We kept the rest of our menu fairly traditional with gravy, biscuits, cranberry sauce, mashed and sweet potatoes, brussels sprouts, broccoli casserole, green beans, vegetable and sausage stuffing. Archana made a butternut squash lasagna that was a big hit. We concluded our meal with Archana’s AMAZING pumpkin and pecan pies with homemade vanilla ice cream and whipped cream. Making fresh whipped cream is easy. Just follow some tips from Olivia of My King Cook. 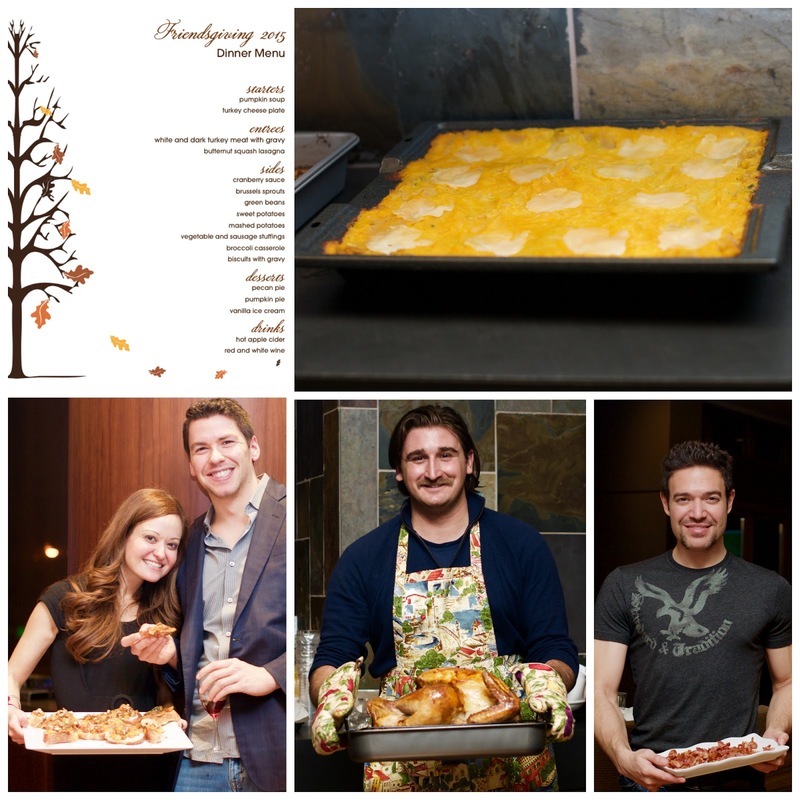 We created our beautiful Friendsgiving menu through Must Have Menus. We kept the table decorations fairly simple as we wanted to make sure the food was the star of the table. We incorporated fall colors on our table- golden yellow, deep browns and vibrant greens. 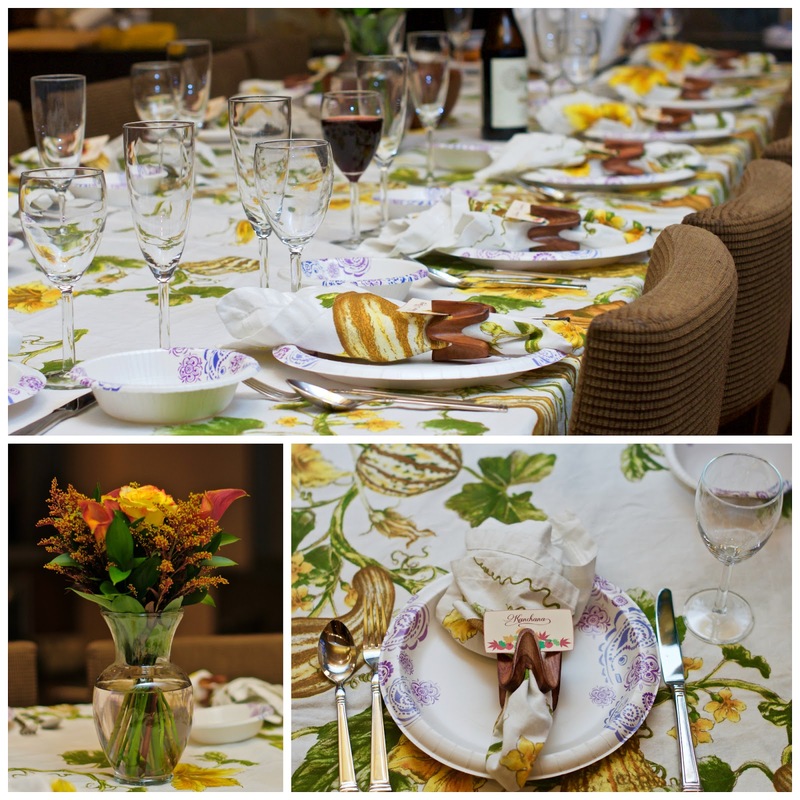 We used Williams Sonoma’s botanical pumpkin and gourd tablecloths and napkins and Pottery Barn’s wooden napkin rings. We placed fall place cards at each table setting. We created a beautiful floral arrangement with brown calla lilies, yellow roses, brown solidago and green leaves. 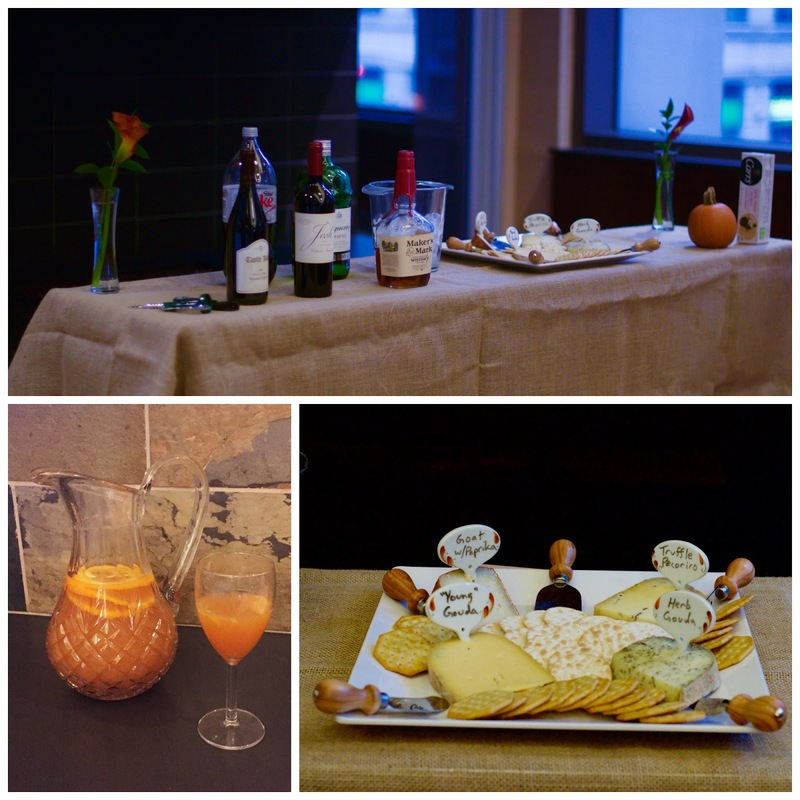 We believe every party should have a signature drink. Our cocktail this year was Emeril Lagasse’s Hot Apple Cider with Rum. For wine, we suggest having at least one white and one red option on hand so that every guest can find something they prefer. For white wines, find a wine with well-balanced acidity. For red wines, look for wines with fairly tame tannins. For Dessert, consider pairing your pecan or pumpkin pies with port, sherry, or even a sweet Riesling. For entertainment we played Wits and Wagers. Many of our guests never played this one. Definitely consider adding it to your next game night! We had a blast at our first Friendsgiving and look forward to spending Thanksgiving with our family. Previous Post Easy as Pumpkin and Pecan Pie! Next Post Eat, Drink and Get Stuffed!